Coming Thursday June 2, 2016 . 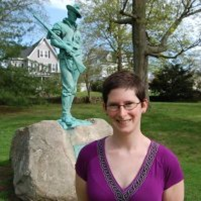 Dr. Sarah Beetham will give a talk entitled Sentinels Keep Watch: The Civil War Citizen Soldier and American Sculpture. Sarah Beetham is an adjunct lecturer in American art and material culture at the Pennsylvania Academy of the Fine Arts. She holds an M.A. and Ph. D. in art history from the University of Delaware and a B.A. in Art History and English from Rutgers University. She has recently published work in Common-Place and Nierika: Revista de Estudios de Arte, and she has a forthcoming article in the spring 2016 issue of Public Art Dialogue addressing the recent controversy surrounding Confederate monuments. Her current book project, titled Monumental Crisis: Accident, Vandalism, and the Civil War Citizen Soldier, focuses on the ways in which post-Civil War soldier monuments have served as flash points for heated discussion of American life and culture in the 150 years since the end of the war. In her talk, Dr. Beetham will explore the material and social history of the citizen soldier monument. First appearing in the years following the Civil War, these monuments were erected to honor the contributions to the war effort by rank-and-file soldiers. They took many forms, from columns and obelisks to triumphal arches and multi-figure groups. But by far the most common were soldiers standing at parade rest, with their rifles held vertically before them and their eyes gazing into the distance. Standing in town squares or in cemeteries, these monuments represent an important legacy of the Civil War.